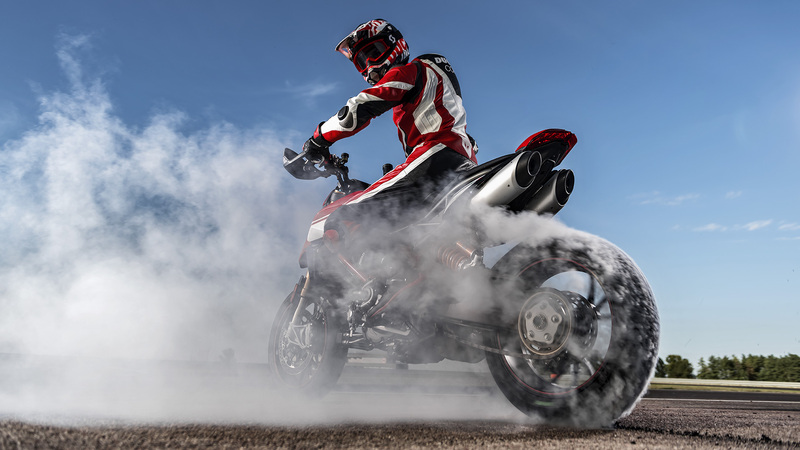 The new Hypermotard 950 is also available in a restricted power version of 35KW, compliant for A2 license riders. 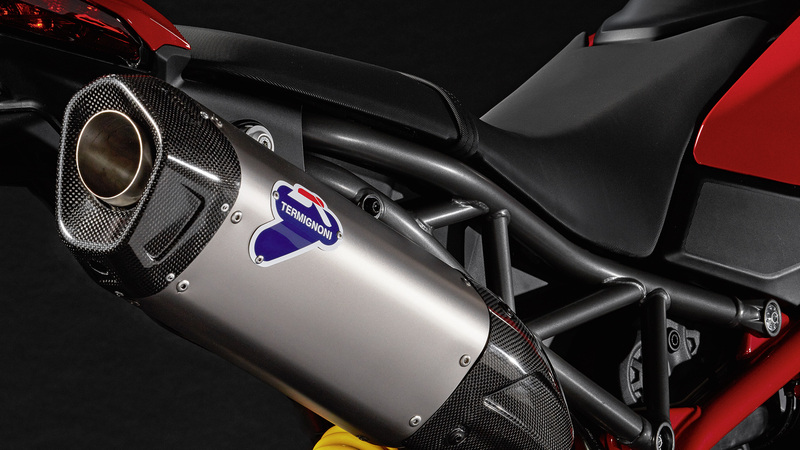 Testastretta 11°, L-Twin cylinder, 4 valve per cylinder, Desmodromic, liquid cooled, magnesium head covers. 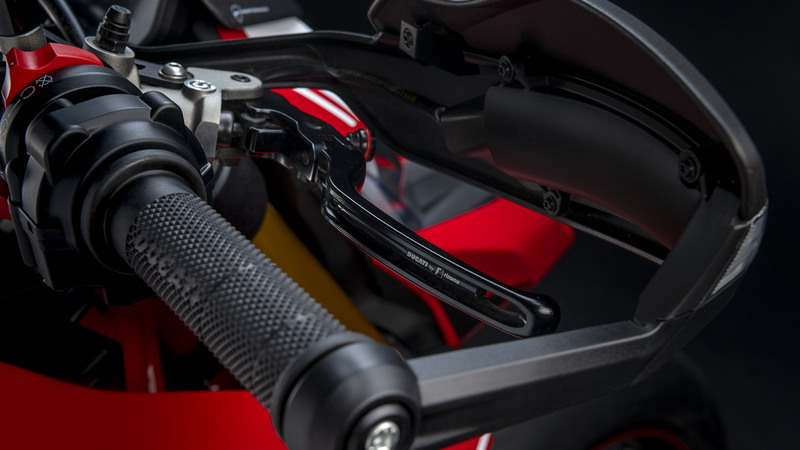 Slipper and self-servo wet multiplate clutch, hydraulic control. 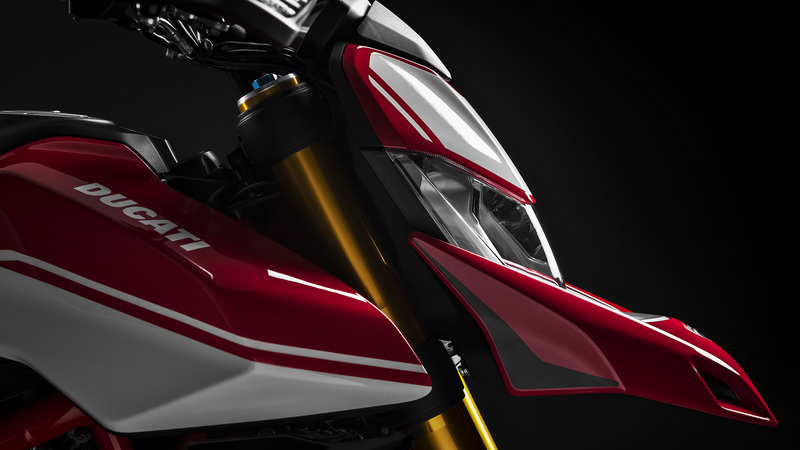 Y shaped 3-spoke light alloy 5.5" x 17"
W shaped 3-spoke Marchesini forged light alloy 5.5" x 17"
The new Hypermotard is also available in a restricted power version of 35KW, compliant for A2 license riders. 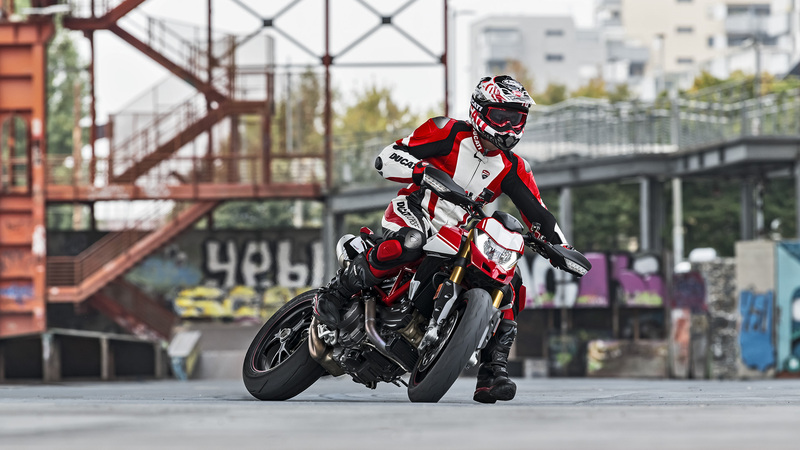 The new Hypermotard 950 SP is also available in a restricted power version of 35KW, compliant for A2 license riders. 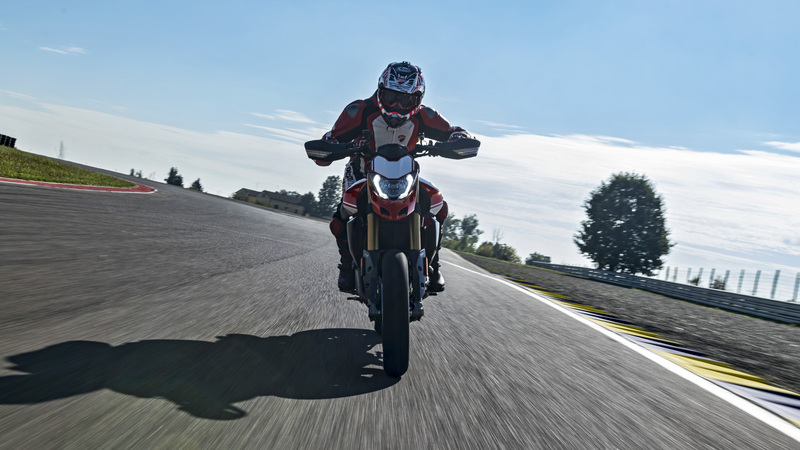 The operating parameters of each control system are associated by default with the three electronic setups, or Riding Modes, available on the Hypermotard 950. 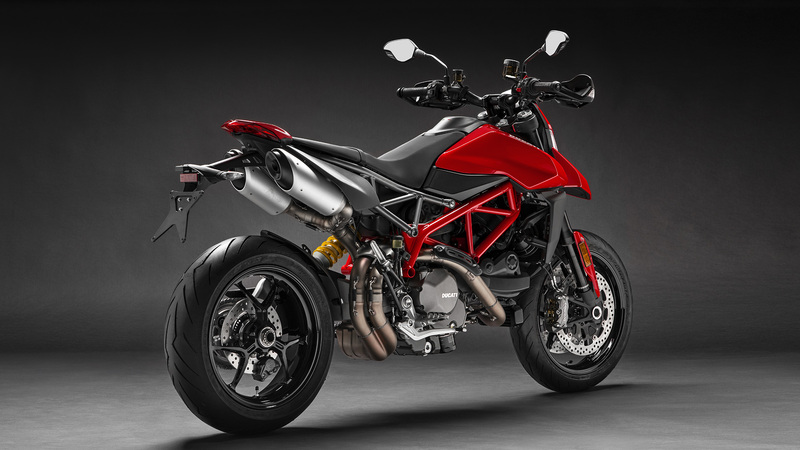 Riders have the ability to customize their riding styles and restore the parameters set by Ducati. 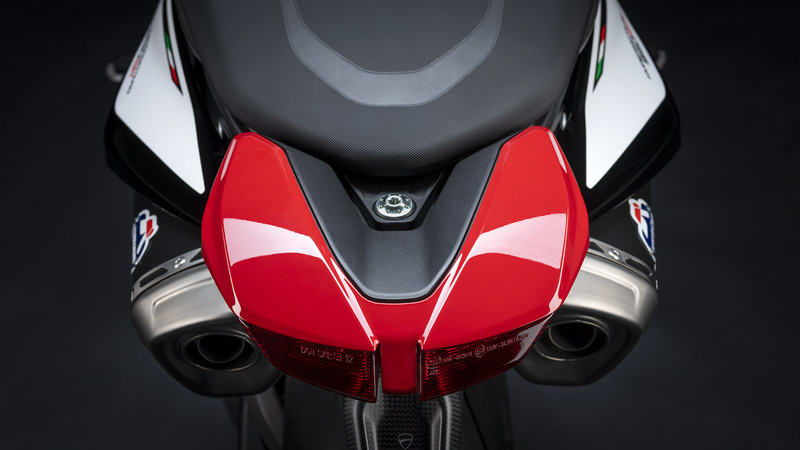 Graphics are reminiscent of the Panigale V4, and offer user-friendly menu navigation and setting adjustments. 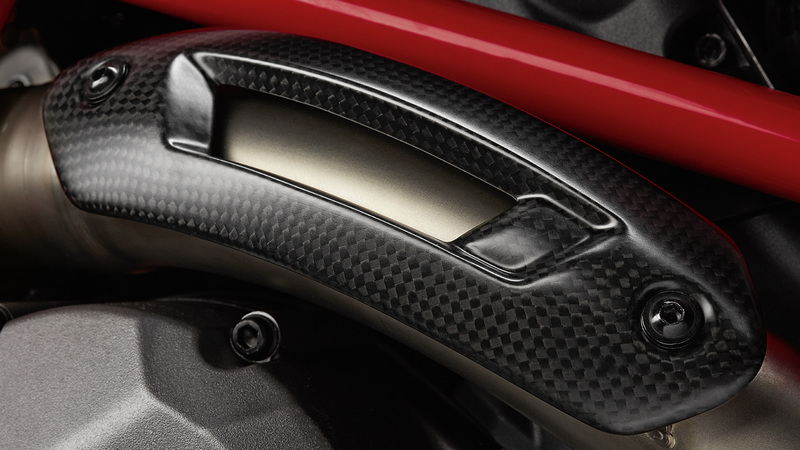 Each Riding Mode is assigned a specific colour for ease of reference. 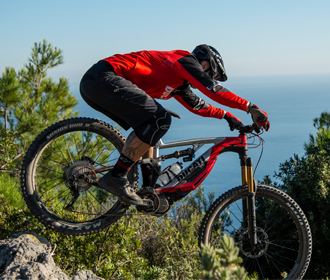 The Riding Mode setting interface provides a clear-cut, comprehensible overview of current changes to the settings with explanatory drawings of the system being set up and a graduated scale that indicates whether a change is more performance or safety/stability-oriented. 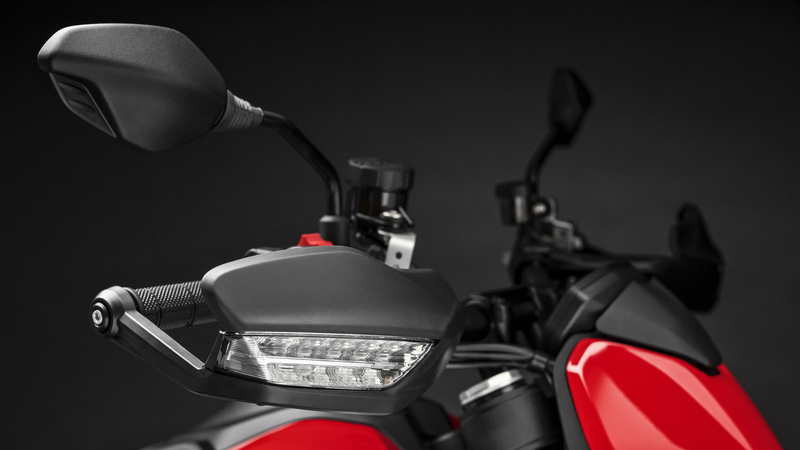 The front light unit features a lightweight, very compact design and uses a headlight with Daytime Running Light (DRL), ensuring high visibility even during the day. 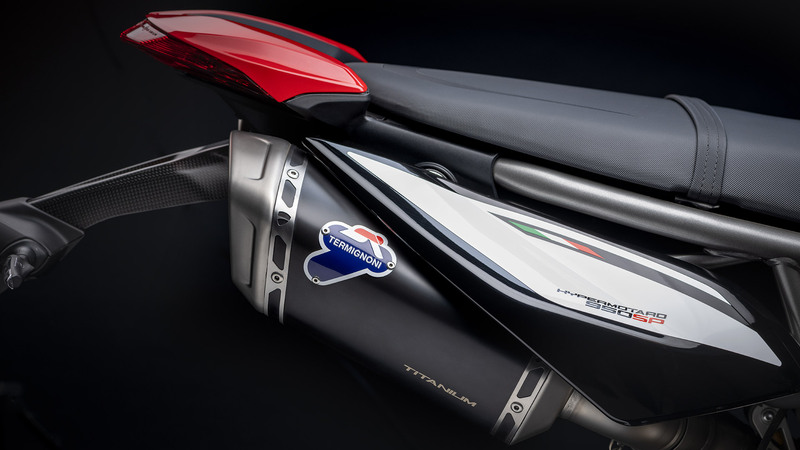 At the rear end, a LED strip doubles as rear and stop light. 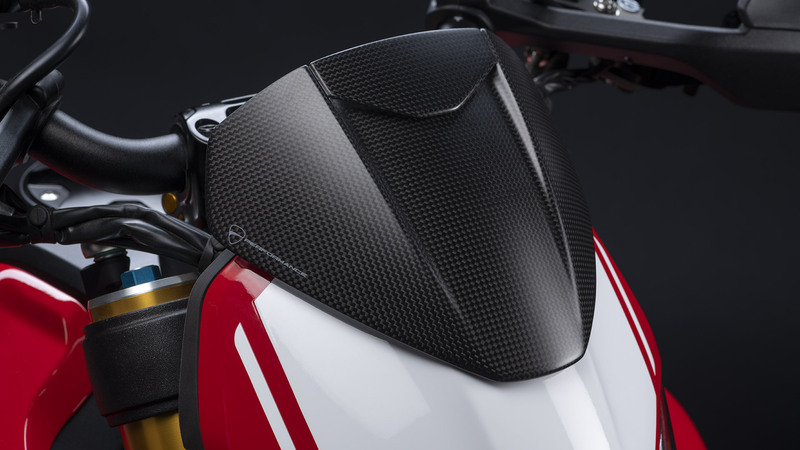 The front LED turn indicators are integrated in the hand guards to keep the Hypermotard 950’s neat lines uncluttered. 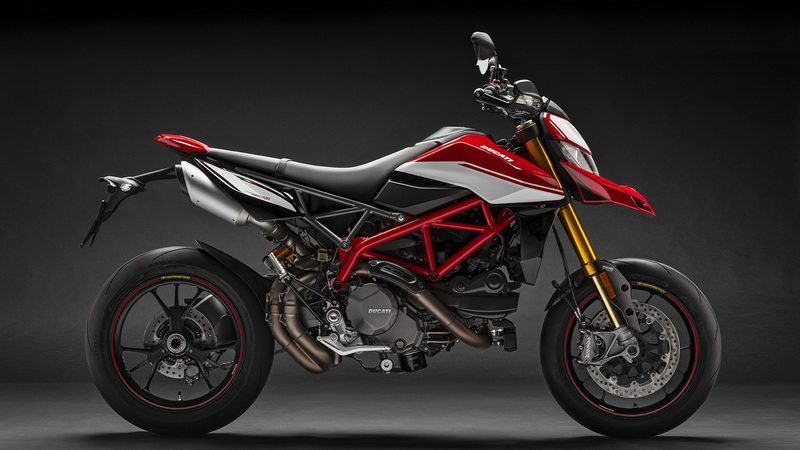 The Hypermotard 950 family is equipped with a revised version of the 937 cu cm twin-cylinder Ducati Testastretta 11°. 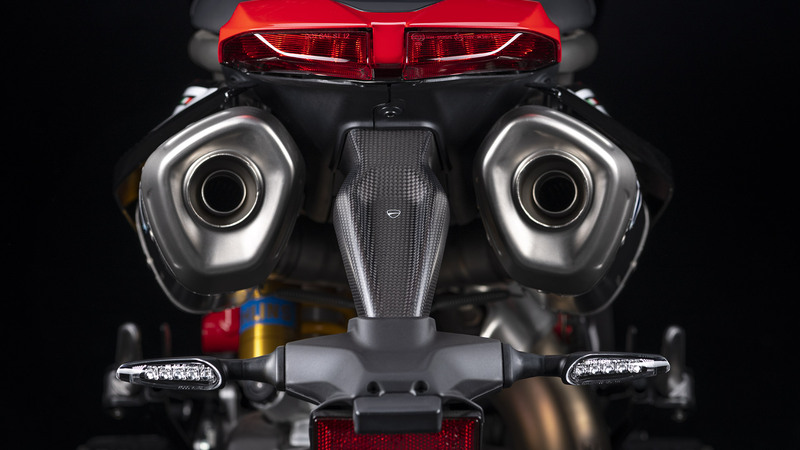 The twin-cylinder engine has been radically revised and lightened (-1.5 kg). 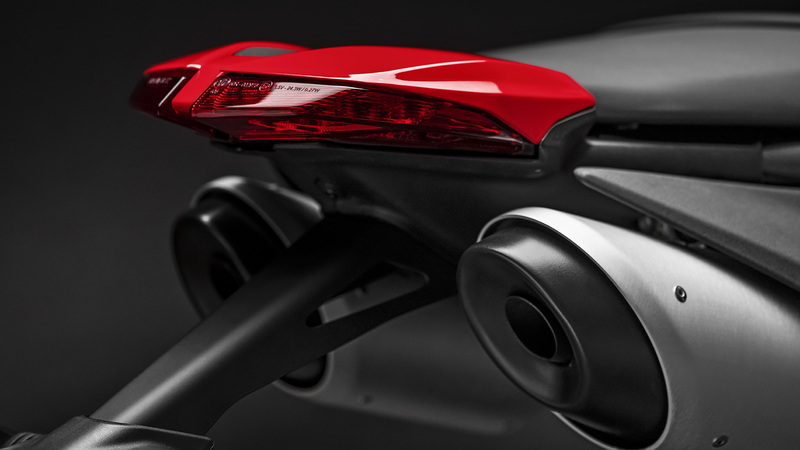 It outputs 4 more horsepower than its predecessor (114 hp at 9,000 rpm) and a flat torque curve peaking at 9.8 kgm at 7,250 rpm. 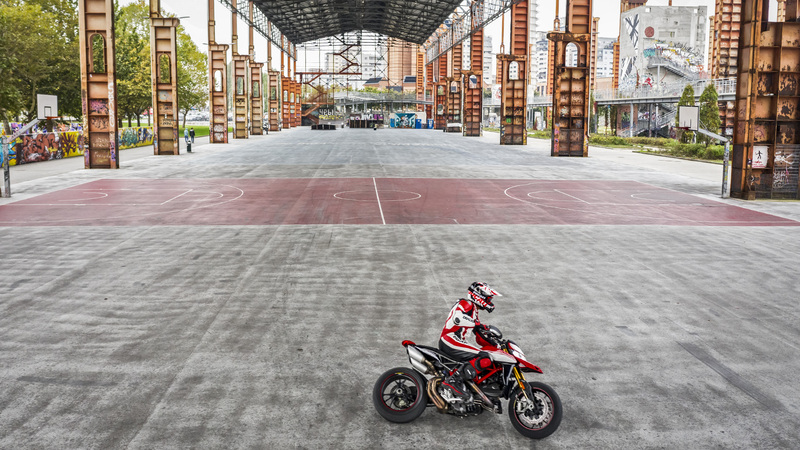 80% of the Hypermotard 950’s torque available at as low as 3,000 rpm, whereas torque output never drops below 88% between 5,000 and 9,000 rpm. 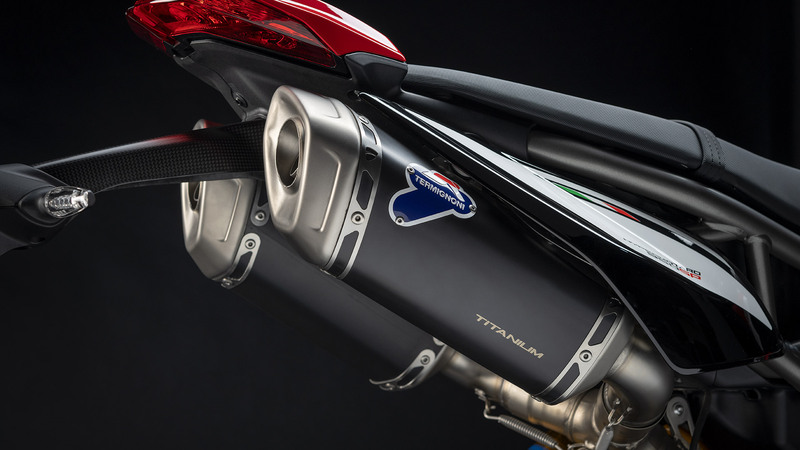 The Testastretta 11° engine has new pistons with a compression ratio of 13.3:1 (compared to 12.6:1 of the predecessor), a new exhaust cam profile and a new exhaust system with the silencers located under the seat. 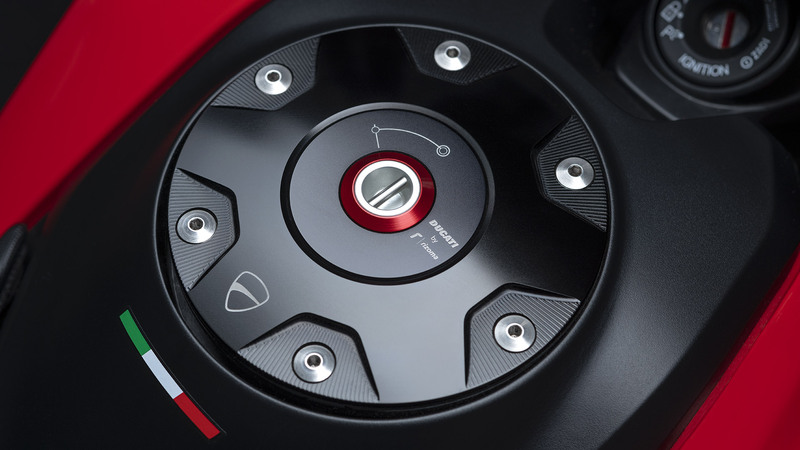 The Testastretta 11° engine features a new throttle body with 53 mm bore, and is controlled by a new engine control unit and a new Ride-by-Wire throttle control system. 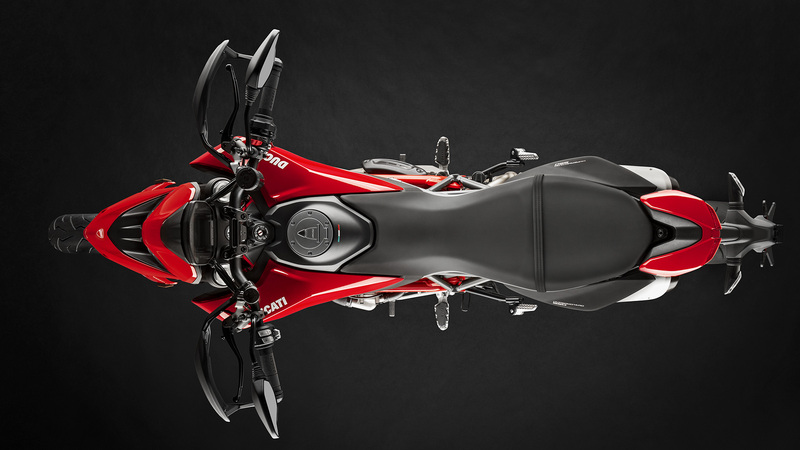 The twin-cylinder engine also sports new, lighter clutch and generator covers, a new lighter selector drum, aluminium rather than steel belt tensioners and magnesium head covers. 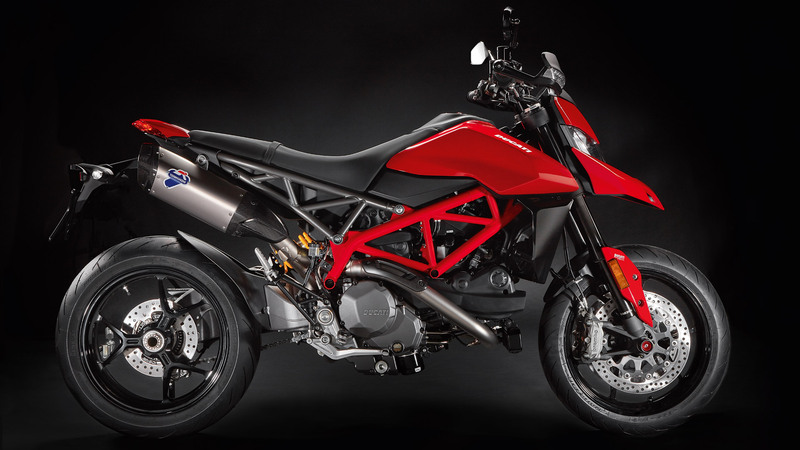 The engine is equipped with a wet clutch with self-servo action and anti-hop function. 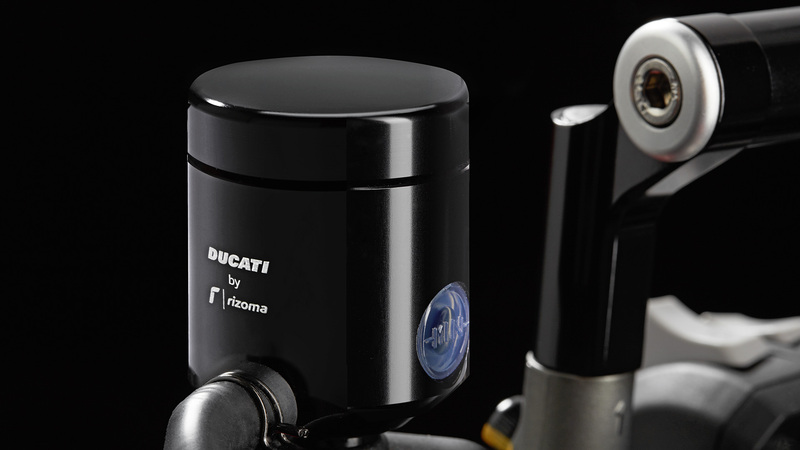 Its new hydraulic control system with adjustable lever help reduce lever effort. 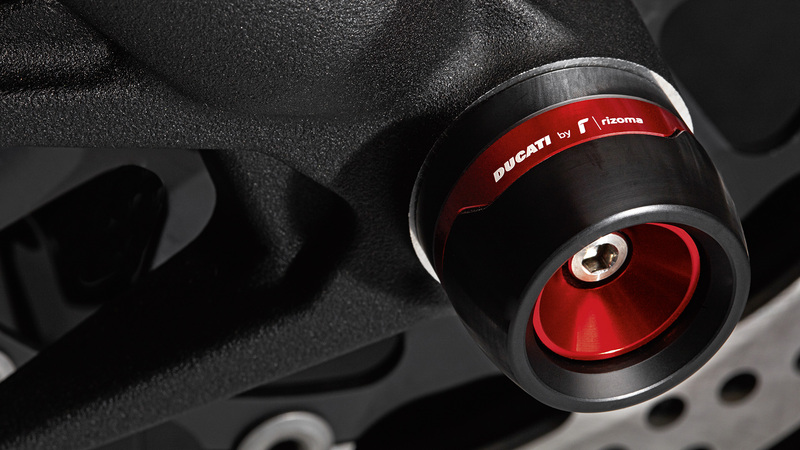 The gearbox sports the Ducati Quick Shift EVO system (DQS EVO) with up/down function. 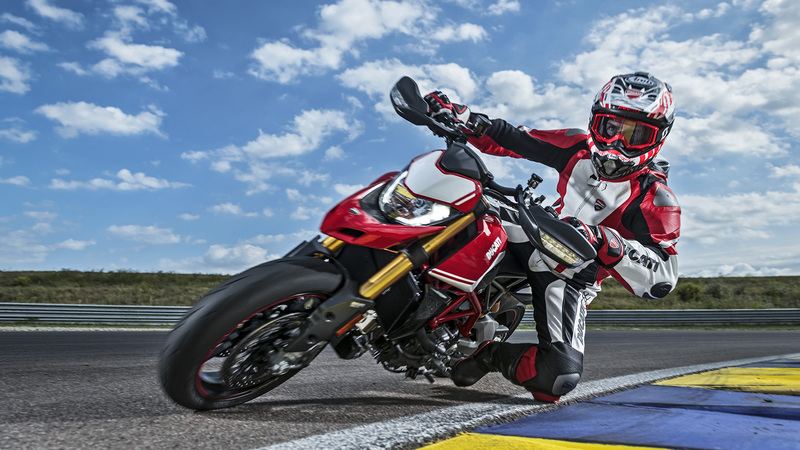 Fine tuned for the Hypermotard 950 and available as an option (from standard on the SP version), it uses the lean angle information to maximise the motorcycle stability during shift changes in corners. 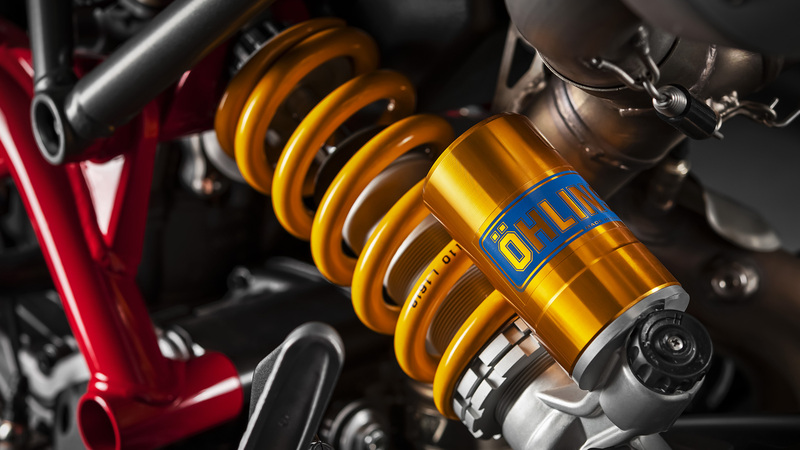 Besides minimising shift times, the DQS EVO allows downshifts without using the clutch thereby ensuring even more effective braking into corners. 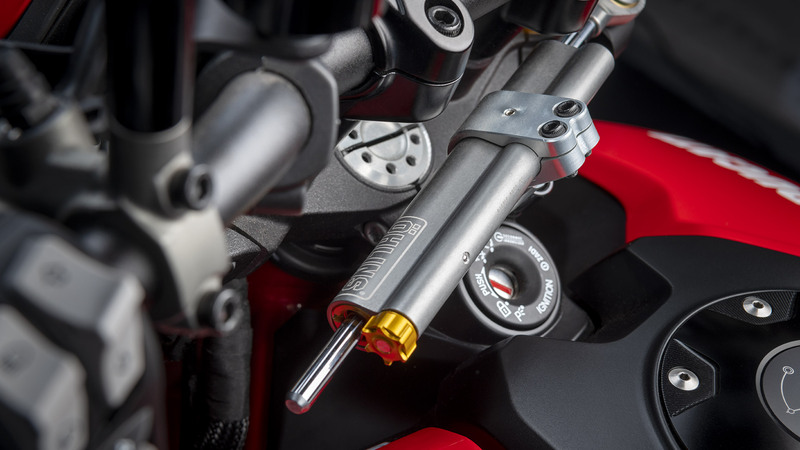 The system acts in a different way for upshifts and downshifts, supplementing the advance firing and injection action during upshifts with the controlled opening of the throttle for downshifts, thanks to the full Ride-by-Wire system. 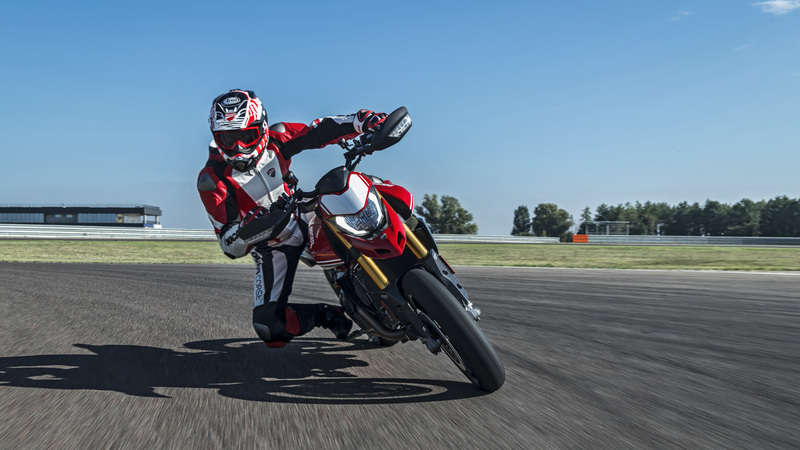 To ensure high braking performance, combined with excellent safety, the new Hypermotard 950 has been equipped with Bosch EVO ABS Cornering system with three-level adjustment. 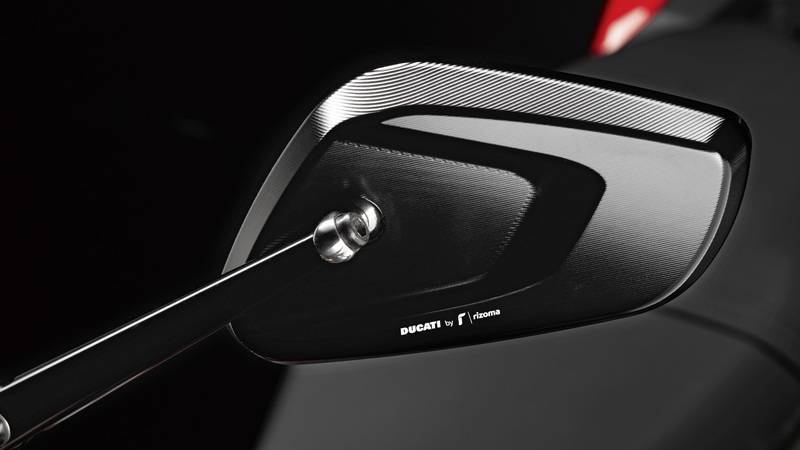 Level 3 is suitable for everyday use on the road or for poor grip conditions. 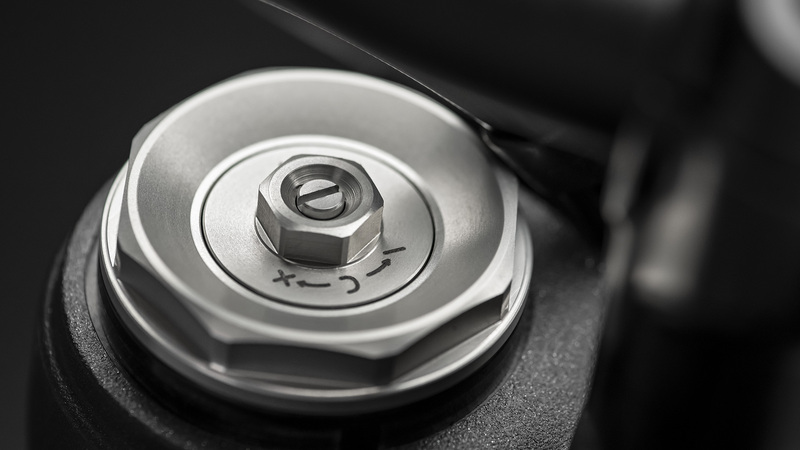 It guarantees safe and stable braking under all conditions, as rear wheel lift is kept under control under harsh braking. 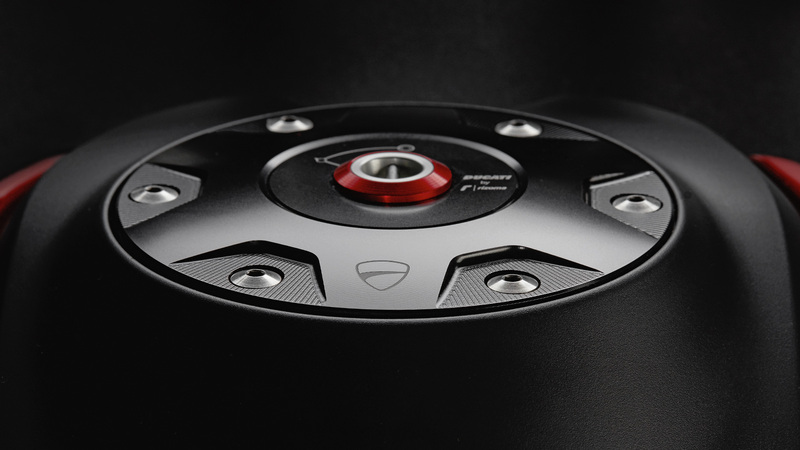 Level 2 always manages both the front and rear braking systems but allows for more aggressive braking with softer lift-up control. This level provides greater safety under braking, even in wet conditions. 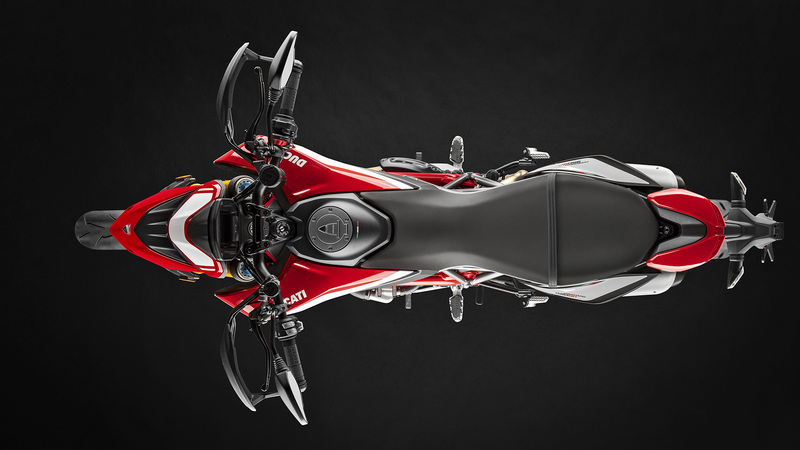 Level 1 introduces a racing-like intervention logic of the cornering system up front, and activates the Slide by Brake function at the rear that allows for sliding into corners using the rear brake safely for better performance in sports riding. In level 1, the rear lift-up control is disabled. 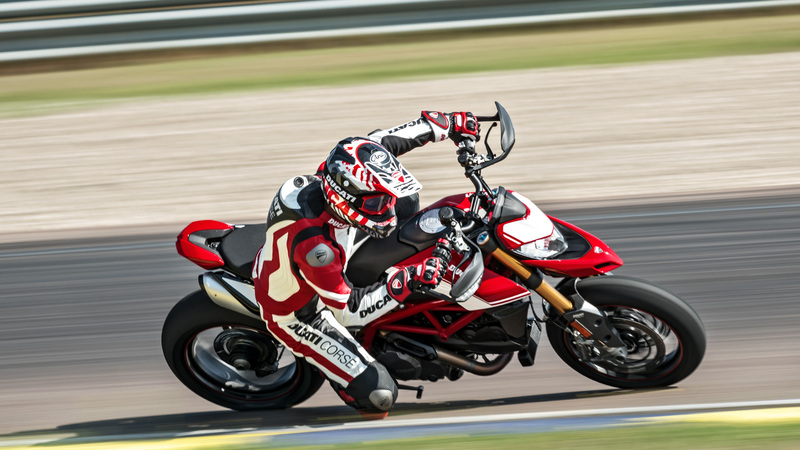 The DTC EVO on the Hypermotard 950 is based on an algorithm that makes its interventions more precise and quick. 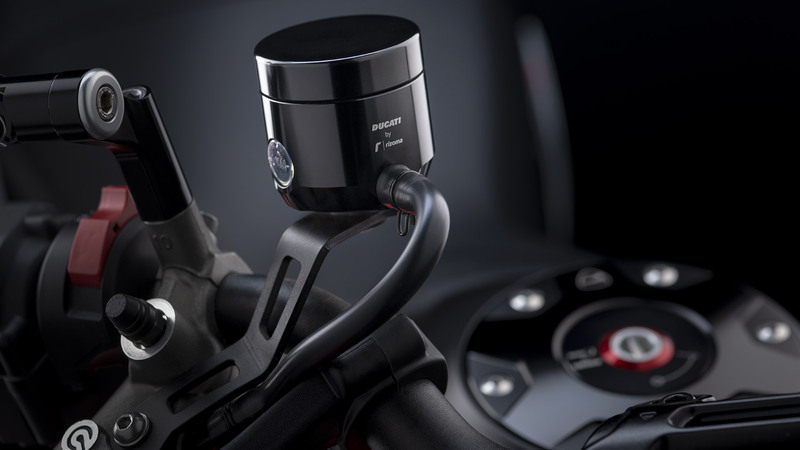 The DTC EVO interfaces with the Bosch Inertial Measurement Unit (IMU) by constantly measuring the bike's angle and using this information to better judge the actions necessary to ensure ideal slipping of the rear tyre (depending on the DTC EVO level set). 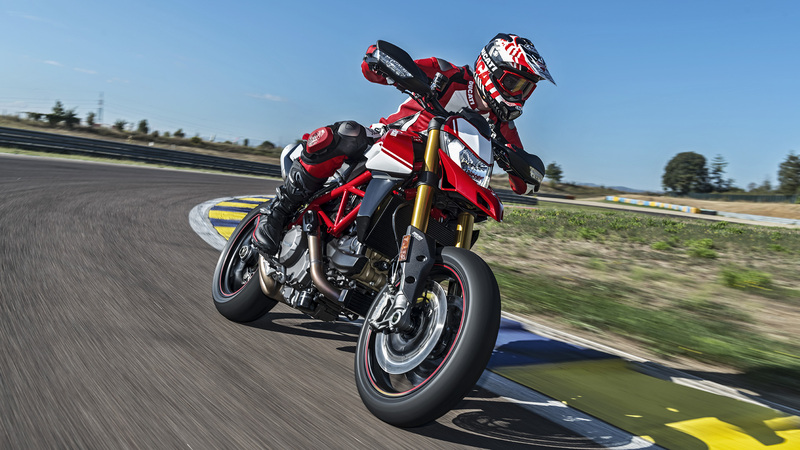 The Hypermotard 950 comes with the latest version of the Ducati Wheelie Control EVO (DWC EVO). 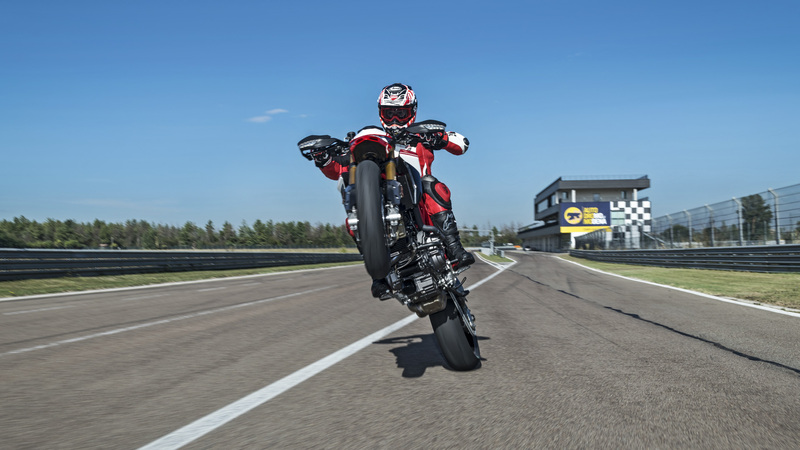 This system uses the information provided by Bosch IMU 6D to prevent wheelies and enables the rider to achieve maximum performance under acceleration with ease and safely. 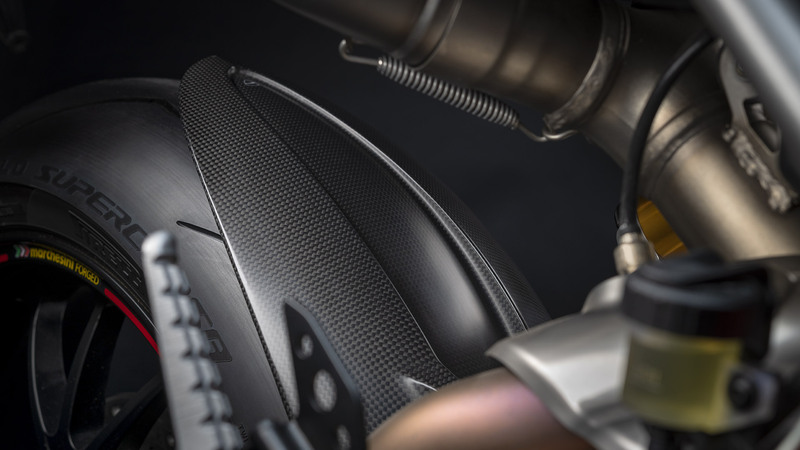 The DWC EVO detects the occurrence and severity of wheelies more accurately, kicks in and controls them with a higher level of precision, so as to respond to rider inputs even more accurately. 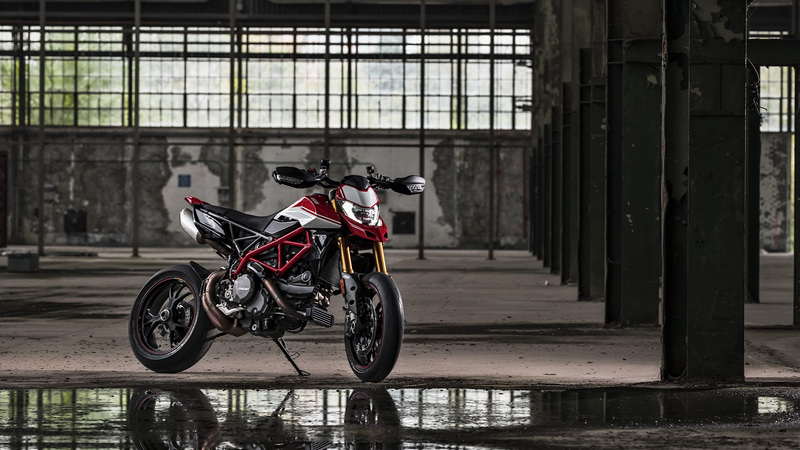 The Hypermotard 950 comes with provisions for the Ducati Multimedia System (DMS), which enables user to answer phone calls, select and play music tracks, and receive text notifications via Bluetooth technology. 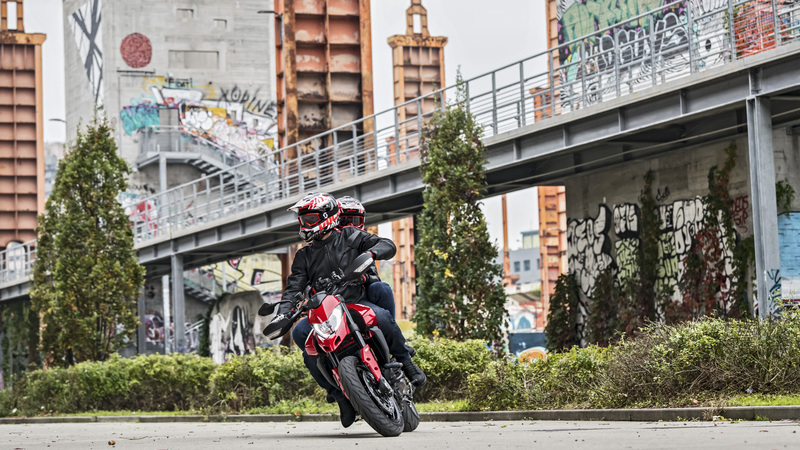 25° steering head angle, 104 mm trail and 30 mm offset allow for stable and safe control without compromising the agility typical of this motorcycle. 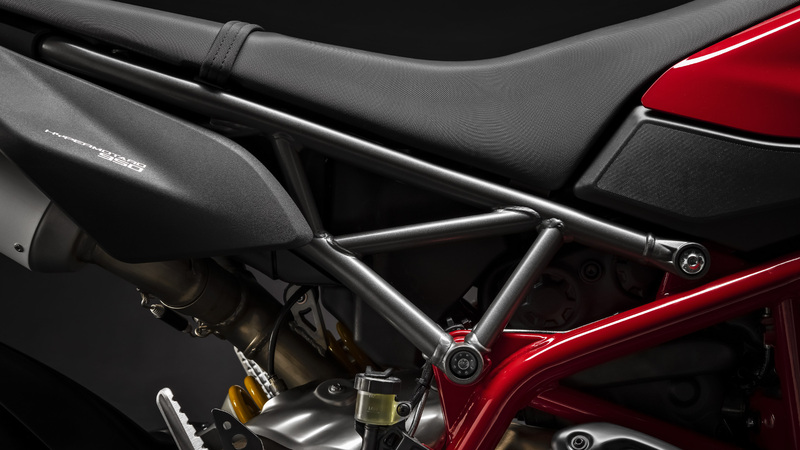 The frame is connected to the rear subframe, also a steel trellis frame, derived from that of the first Hypermotard. 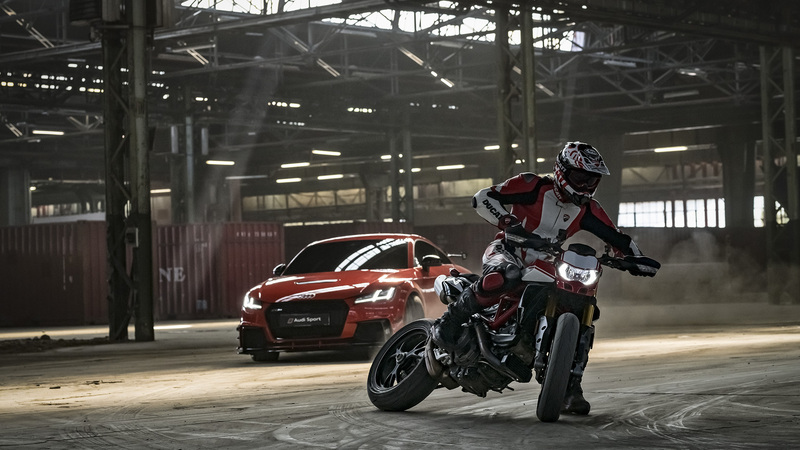 A wide steering angle of 70° allows great handling, while the 1,493 mm (1,498 mm for the SP version) wheelbase allows maximising stability at high speeds. 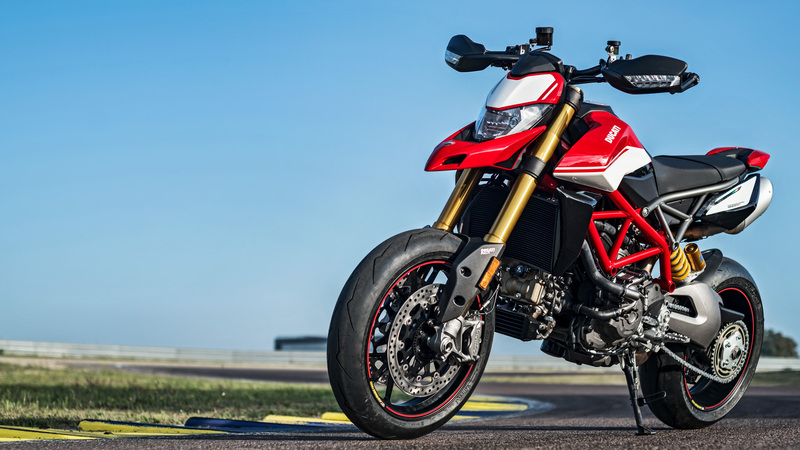 The fuel tank, with 14.5 litre fuel capacity, lends the Hypermotard 950 excellent overall range without spoiling its essential, curvy lines. 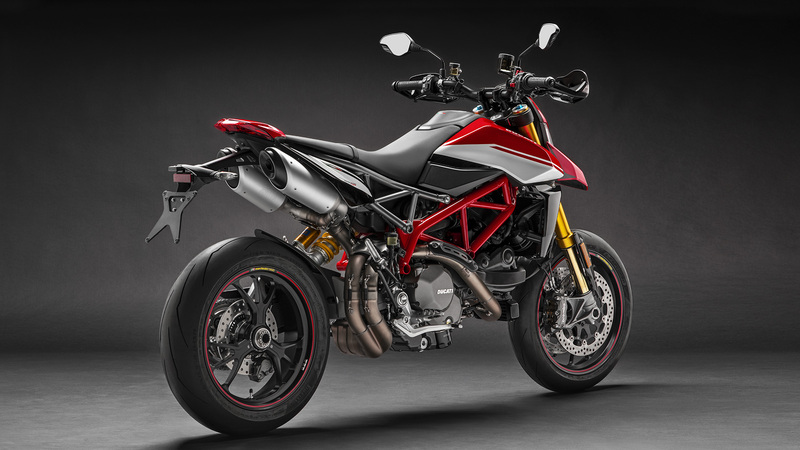 The Hypermotard 950 sports a single-sided aluminium swinging arm. 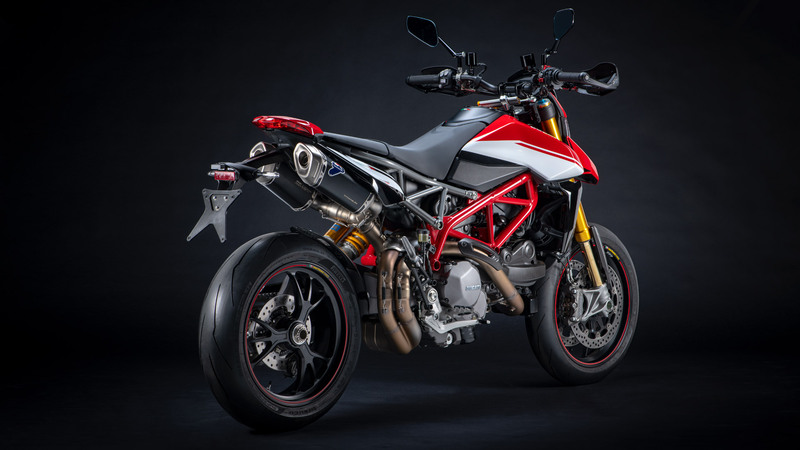 The Hypermotard 950 is equipped with a new Marzocchi fork with fully adjustable 45 mm aluminium tubes and stanchions, and 170 mm wheel travel that shaved off 500 grams compared to the unit installed on the previous version. 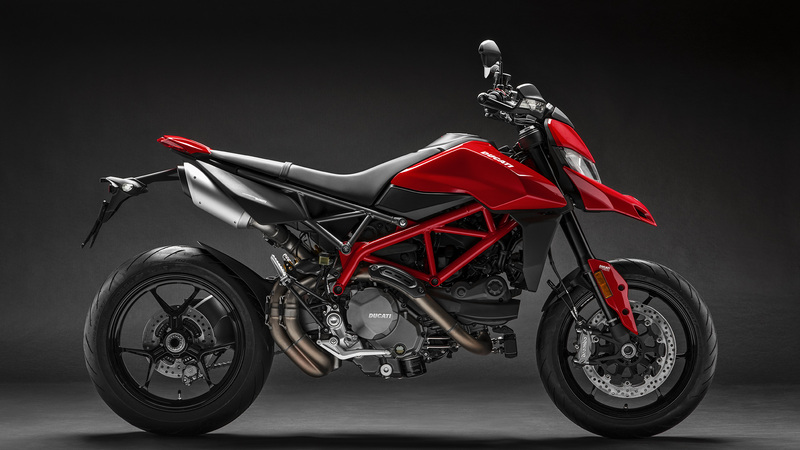 At the rear, the 950 sports an adjustable Sachs shock absorber, with 150 mm wheel travel. 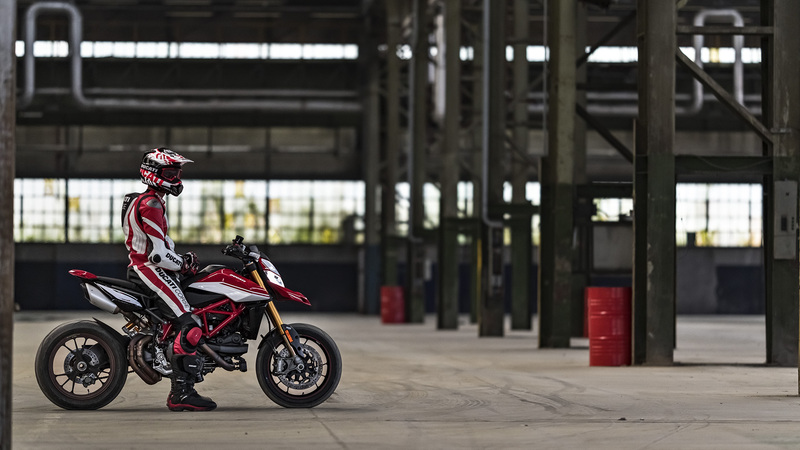 The Hypermotard 950 SP, on the other hand, is equipped with a fully adjustable 48 mm Öhlins fork with 185 mm wheel travel and a fully adjustable Öhlins shock absorber with 175 mm wheel travel. 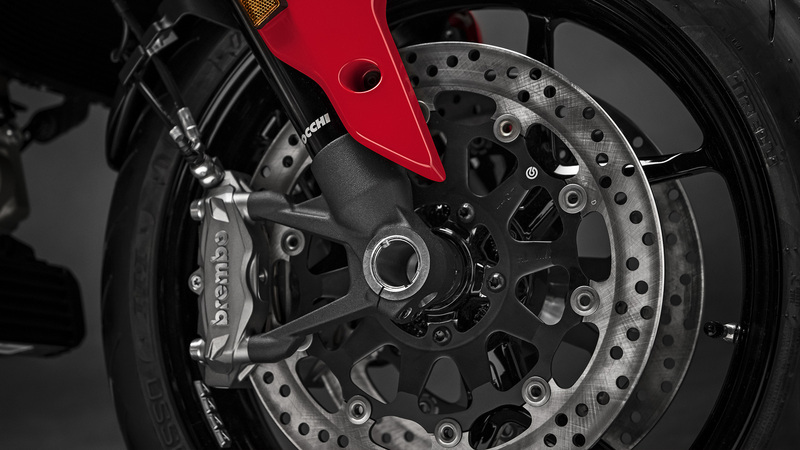 The front braking system features two monobloc radially-mounted 4-piston Brembo M4.32 callipers operated by a radial brake master cylinder with adjustable 5-position lever. 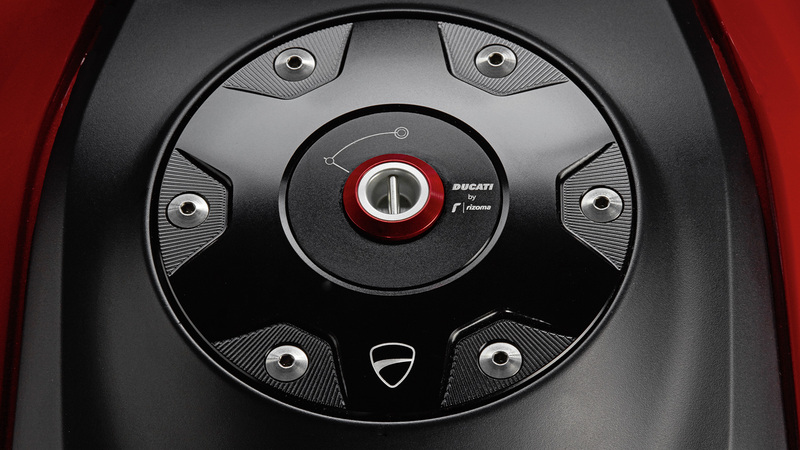 On the front end the discs measure 320 mm and feature aluminium flanges (for a total weight reduction of 600 grams), while at the back there is a single 245 mm diameter disc gripped by a single Brembo calliper. 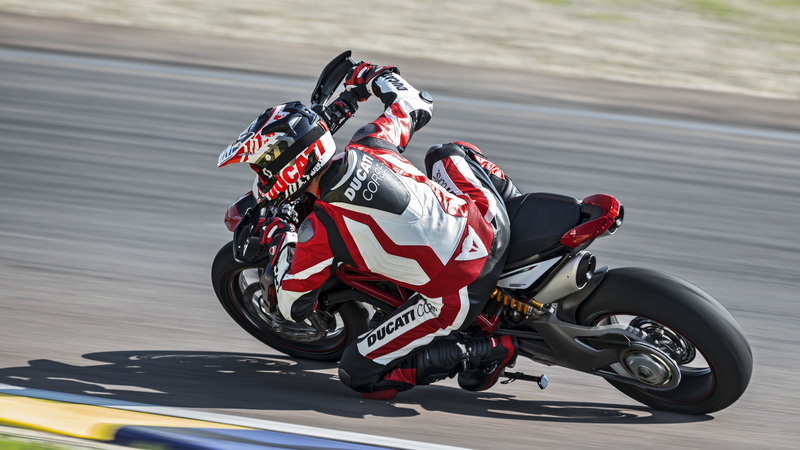 These components ensure a braking performance that sets the standard for the industry, a characteristic that has always been common to all Ducati bikes. 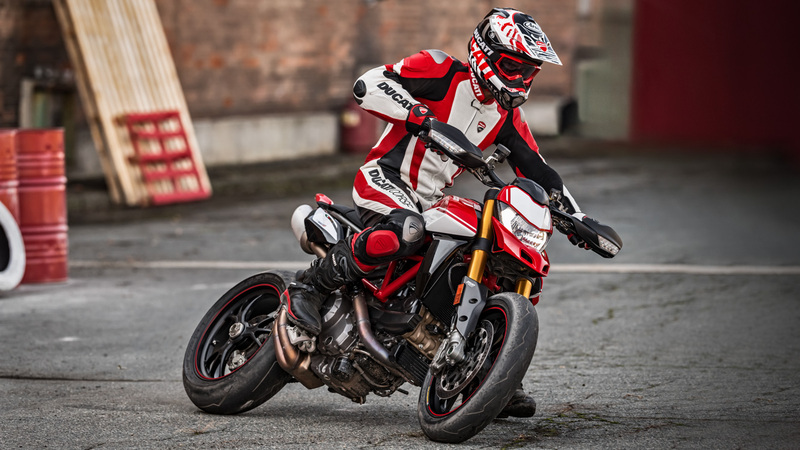 The Hypermotard 950 is equipped with 3-spoke Y-shaped aluminium rims with 3.5" section up front and 5.5" section at the rear, and is fitted with Pirelli Diablo Rosso III tyres, namely 120/70 ZR17 up front and 180/55/55 ZR17 at the rear. 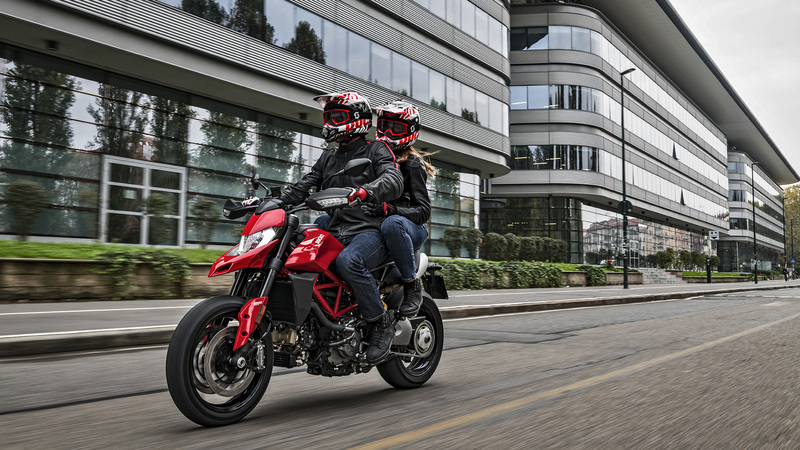 Choose the Hypermotard 950 model that you prefer and contact a dealer for a test ride booking.